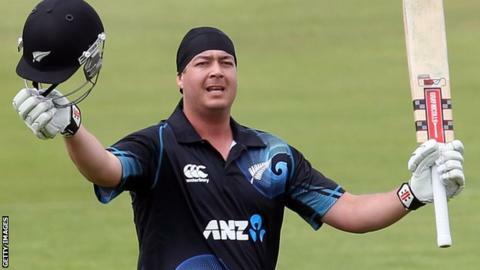 Essex head coach Paul Grayson has said big-hitting batsman Jesse Ryder could prove to be a "box office" signing. The 29-year-old New Zealand international will join the club in May and feature in all formats this season. "I'm excited about bringing him to the club, he'll put a few bums on seats," Grayson told BBC Essex. "He hits the ball hard and likes to entertain. I think he'll fit in with us. But if he gets going at Chelmsford there may be some fireworks." Ryder arrives with a chequered history in the game, having most recently been dropped from the Kiwi Test side and omitted from the World T20 squad after a drinking session. He also overcame a period in hospital last year, when an attack outside a Christchurch bar left him in a medically-induced coma. But his batting figures are strong, averaging 40.93 across 18 Tests as well as 33.21 in ODIs and 22.85 in T20 internationals. The left-handed batsman, who also bowls right-arm medium pacers, could be available to face Leicestershire on 5 May, by which point Alastair Cook and Ravi Bopara are expected to have linked up with England for the one-day series against Sri Lanka. "He's box office, we know that. He's got a very good record, he's available and will hopefully be in the country in a couple of weeks, maybe for the Leicestershire game," said Grayson. "Ravi and Alastair might be away for that game. "In one-day cricket he'll be looking to bat a the top of the order. But in the Championship he may fit the middle order. "